For industrial pressure washers in Derbyshire look no further than Britclean. Offering unrivalled choice at a competitive price, it is no surprise that customers travel from outside of Staffordshire for our service. For over 20 years Britclean has been providing industrial pressure washer to areas of the Midlands and out of our workshop in Stoke on Trent, we stock some of the world leading manufacturers for domestic, commercial and industrial pressure washers. The brands we stock are paving the way in terms of industry standard. 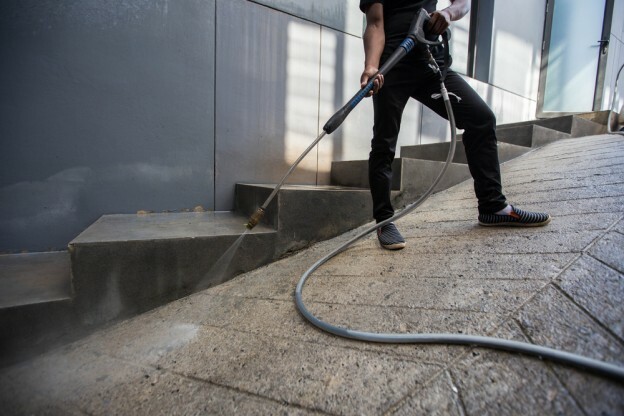 Brands such as Karcher or Nilfisk have been producing hot and cold pressure washers for decades, and therefore, make light work of any industrial clean project you might have. If you’re in the market for industrial pressure washers in Derbyshire we provide both sales and hire services. When hiring form Britclean, the choice is in your hands for how long or short you need your washer for. Many industrial projects are ongoing with changing circumstances, so a fixed contract length would not be viable. Additionally, our team can complete full serving, repairs and training on any pressure washer of any era. If your washer isn’t working to maximum capacity, then do not hesitate to bring that up when speaking with us. We usually operate on a 24hr turnaround period on repairs (where possible). Our quick turnaround allows you to get back to the job at hand with minimal disruption. Get in touch with our team today to discuss hire or sale packages on our industrial pressure washers in Derbyshire. We don’t believe in a sales team, so the people you speak to have had hands-on experience with all of our products. Therefore, you can rest assured that when you contact Britclean you’re getting the right and relevant information based on your requirements. This entry was posted in Britclean UK and tagged Industrial Pressure Washers Derbyshire on June 24, 2018 by admin.